AMETEK and U.S. Gauge offer a wide variety of welding and compressed gas pressure gauges for use on various types of regulators. Our Model 600 high pressure gauge offerings are used for measuring cylinder or tank pressure, while those in our low pressure gauge family are used on the downstream side of a regulator to indicate regulated, reduced pressure. Our high pressure gauges are UL 404 listed. The low pressure gauges (30 psi to 1499) are UL 252A recognized, Class V (3000 psi test pressure) and above. Cleanliness for all the high and low pressure gauge offerings is in accordance with Level IV of ASME B40.100-1998. 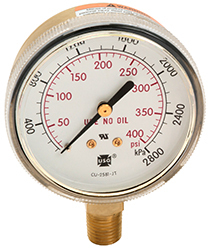 Every Model 600 compressed gas pressure gauge is available in 1½”, 50 mm, 2”, and 2½” inch gauge sizes, in your choice of polished brass, gold painted steel or ABS cases, depending on your requirements.